I heard about eggplant lasagna a long time ago, but at the time, the only thing I knew about eggplant was that a lot of people don’t like it. But then I saw a recipe for fried eggplant sandwiches that I really wanted to try, and they turned out well. Then I tried making eggplant chili, and liked it a lot. 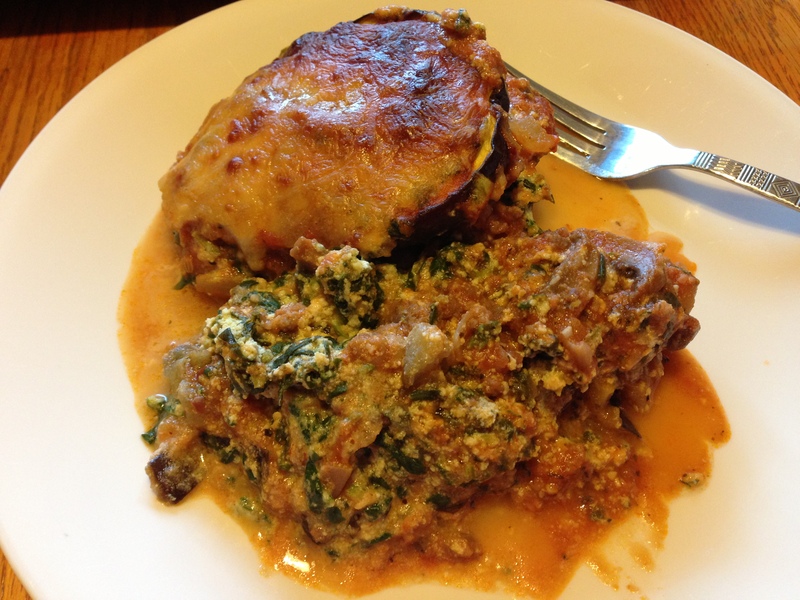 So, I thought the time had come to try eggplant lasagna. As it turns out, it tastes remarkably like regular lasagna. As an added bonus, it’s already a low-carb dish without doing much to alter it. 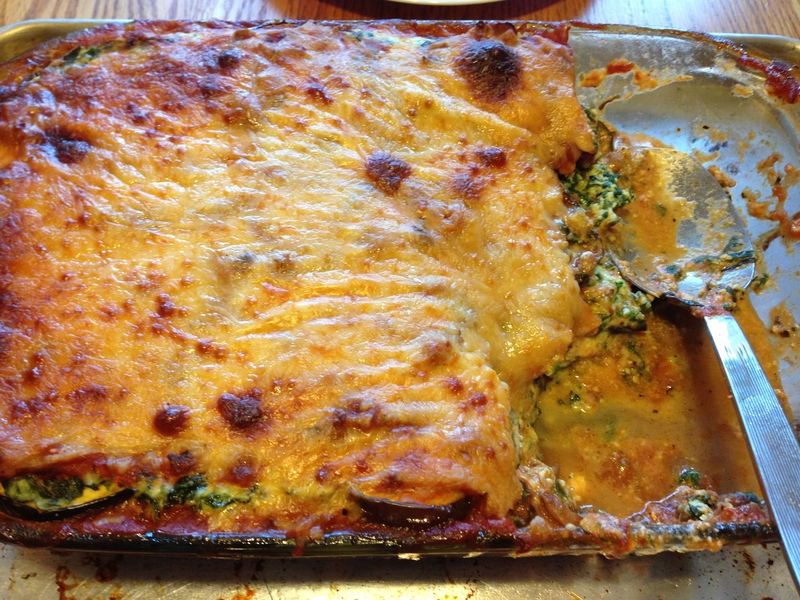 This is recipe is for a full 9×13 dish of lasagna. It’s enough for 8 large servings, or 10 if you are going to serve a salad with it. If that is too much, just halve the recipe. 2 eggplants, a total of 2.5-3 lbs. To get the eggplant ready, take off thin strips of the peel, lengthwise, every inch or so with a vegetable peeler or paring knife, like you would with a cucumber. The goal is not to peel them. You just want to break up the peel so that it will be easier to cut and eat once it’s in the lasagna. Slice the eggplant in rounds, about 1/4 inch thick. Spray two baking pans well with olive oil. Place the eggplant in a single layer on the pans, spray the top with olive oil (or lightly brush if you have no way to spray oil), and season with salt and pepper. Roast the eggplant in the oven for about 25 minutes, flipping the slices over halfway. They should be soft and lightly golden when done. Turn the oven down to 350º after roasting the eggplant. While the eggplant is roasting, brown the sausage along with the onions in a saucepan, and when the sausage is almost done, add the garlic. When the sausage, onions, and garlic are cooked, add the mushrooms, spaghetti sauce, basil, and Splenda. Simmer for a few minutes, and then taste the sauce. The Splenda should have counteracted the bitterness in the no-sugar added sauce, but if you still find it to be bitter, add one packet at a time until it’s pleasant. It shouldn’t take much. Keep the sauce simmering gently until you’re ready to construct the lasagna. In a large bowl, combine the ricotta cheese, spinach, eggs, and Parmesan cheese. Mix everything until it’s well combined. You’re now ready to construct the lasagna. Spread some sauce on the bottom of the baking dish, about a cup. Put down a single layer of eggplant, spread a thick layer of ricotta/spinach evenly over it, put down a layer of sauce, and then sprinkle with mozzarella cheese. Continue layering in this order. Use most of the ricotta/spinach on the bottom two layers, and just save a little for the top. Also, go light on the mozzarella on the bottom two layers and save a majority of the mozzarella for the top. You will have some sauce left over and the baking dish will probably be extremely full. Put the baking dish on a baking sheet, to catch anything that bubbles over, and bake at 350º for 40-45 minutes.